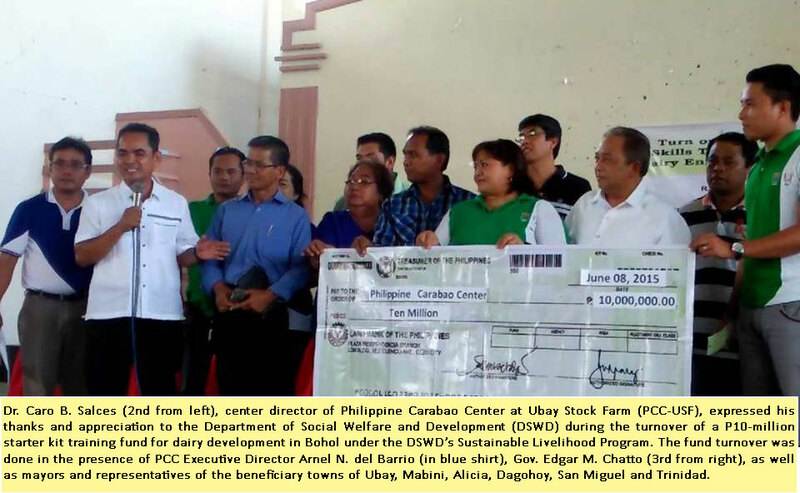 Continuing efforts aimed at the development of the local dairy industry has received another boost with the transfer of a P10-million starter kit training fund from the Department of Social Welfare and Development (DSWD) to the Philippine Carabao Center at Ubay Stock Farm (PCC at USF). The fund transfer was done during a ceremony held June 8, marking the collaboration of PCC and DSWD under the latter’s Sustainable Livelihood Program (SLP). Considered a first in the country, the joint endeavor traces its origin to a Memorandum of Agreement (MOA) entered into by PCC at USF and DSWD Field Office VII in 2014 for the development a Pilot Dairy Commodity Cluster Model Project in the Bohol province under the DWSD’s SLP. “DSWD provides the fund intended for the starter kit training on dairying for 500 beneficiaries,” explained Jennifer Quimno, DSWD-7 SLP regional project coordinator. Aside from the fund, DSWD is also responsible in the validation on the eligibility of the SLP beneficiaries. On the other hand, PCC is responsible on the procurement of carabaos as the basic resource for the starter kit training, validation on the compliance of the recipients to dairying requirements, and the provision of technical assistance and forage development. Moreover, PCC at USF and DSWD-7 will jointly undertake provide social preparation and community-driven enterprise development (CDED) sessions and interventions that may be deemed necessary in the implementation of the project. They will establish tie-ups with other public and private partners for continuous skills and micro-enterprise development trainings as well as provision of needed common facilities in milk production or milk processing. Aside from the DSWD fund, the Bohol provincial government headed by Gov. Edgar M. Chatto has provided a counterpart of P916,500 for the one-year insurance of the animals. Dr. Arnel N. del Barrio, PCC acting executive director, said the convergence initiative is significant because it means income not just for the farmers but also for Bohol province. “If lahat (500 beneficiaries) ay kukuha ng isang liter (of milk) araw-araw, meron na kaagad kayong 500 liters of milk a day, at kung ito ay bibilhin ng P50 per liter, meron na kayong P25,000 in one day [If all of the 500 beneficiaries are going to harvest a liter of milk everyday, there will be 500 liters of milk a day. If this will be bought for P50.00 a liter, there will be P25,000 accumulated income per day. ],” he explained. He further stated that with intensive care on the carabao, the farmers can milk it for 200 days, thus they can achieve an income of P5 million in a year. Dr. Caro Salces, PCC at USF center director, expressed his appreciation for the support and trust given by the DSWD and the provincial and local government units during the turn-over ceremony. “I’m glad that our leaders can speak of the program very well. They are better promoters of the program,” he said. “Thank you PCC at USF na pinangunahan n’yo ang magandang programang ito, baka ka ‘ko ay kopyahin namin ito sa iba pang lugar (Thank you PCC at USF for spearheading this wonderful program, we might even implement this in other areas,” said Dir. del Barrio.